It was about 12 years ago and I was in Atlanta at my aunt’s house on my way to Savannah to meet someone who I met online which turned out to be an episode from Tales from The Crypt. But before I left, a friend of mine told me to download The Secret from Limewire(Napster’s younger brother) and to watch it. She didn’t tell me anything about it, just to watch it. About an hour later it had finished downloading around 2:00 am. I hit play and for the next hour or so, I was frozen as if I just saw a fleet of UFO’s descend from the sky. Everything they were elucidating The Law of Attraction, visualization, having a positive attitude was just what I needed to hear, it came at just the right moment in my life. I felt like The Secret was produced just for me. At that time in my life, I was a negative nancy, I made the Grinch seem like Mary Poppins. I always talked about, complained about, and thought about everything I disliked, everything I loathed. But after watching The Secret I consciously stopped all of that. It took me quite a while to stop being negative holistically, as my subconscious mind continued to radiate negative thoughts and emotions when triggered by certain people or places. But the way The Secret presented “The Law of Attraction” was not beneficial for me, because sitting around passively visualizing while munching on Trader Joe’s Nacho Cheese Tortilla Chips didn’t quite lead me to my Shangri-La. I found more advanced books on the Law of Attraction that helped me incredibly, such as “The Master Key System” by Charles Haanel, which discussed and explains other universal principles one needs to know to create ones desired reality. You can buy “The Master Key System” clicking here. Then last week friend of mine discovered “The Meta Secret“, I thought, “the meta Secret? What’s that?”. I started to google it and it turns out it was a sequel produced in 2010 by Dr. Mel Gill. So how did I miss this, when I first watched The Secret I was googling for any related information for years on the internet. Not to be a conspiracy bum, but most people have seen the second production of The Secret, which excluded Esther Hicks who in my view was the most important personage in the movie. I have seen the first production that included Esther Hicks, and it’s vastly different from the second production. In my perception, the second production seems to be putting subliminal negative messages in your mind, while also denying you the valuable information Esther Hicks divulged in the first production. But after watching The Meta Secret, I wouldn’t be surprised if the powers that be did everything possible to keep people from watching this, because freeing the minds of people is not in their best interest. 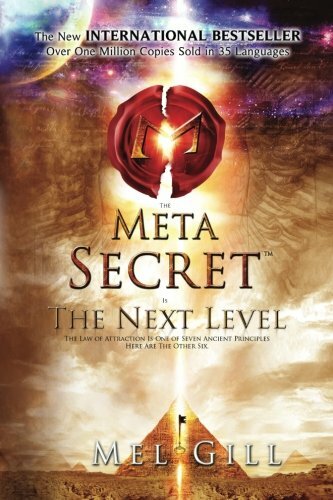 Anyway, The Meta Secret is not just another movie re-interpreting ” The Law of Attraction”, it’s much more than that. It introduces you to the 7 Hermetic Laws which was the philosophy which flowered the Rennaisance which in turn created western civilization. Historically, some of the Renaissance pioneers were burnt alive on stakes by the Catholic Church for heresy because they were students of hermeticism. You’ll see some of the same faces like Bob Proctor, Joe Vitale, and Jack Canfield, as well as some new interesting faces. I really enjoyed this movie, it explained many concepts I had previously discovered on my own as well as some new concepts. I loved how they oppose the “sitting at home and passively visualizing” conundrum, hoping that all your dreams will materialize on your lap. They go into depth in how to use your mind, feelings, action, the law of attraction as well as the other 6 hermetic principles to use the power of your mind and the universe to manifest your dreams. You can watch The Meta Secret for free on youtube, there are 3 really bad copies, this one here seems to be of the best quality. You can also watch it here Tubitv.com, this one has the best quality. I would love to hear peoples stories of applying the 7 hermetic principles in the comment section.